North Otago will again host the Network Waitaki Boys and Girls Basketball tournament. Pupils attending school in Yr 7 & 8 are eligible to attend this tournament. Depending on team numbers, the tournament may start early on the Friday morning and run through to late Sunday afternoon. This tournament is held on Friday 13th to Sunday 15th July at the Waitaki Rec Centre. If you are interested in entering a team or require further information, please email Bronwyn Banks at bronwyn@hopelegal.co.nz An entry form is available from the school office. Highway Highlanders have notified us there will be road closures on State Highway 1 between 9th May - 12th June 2018. 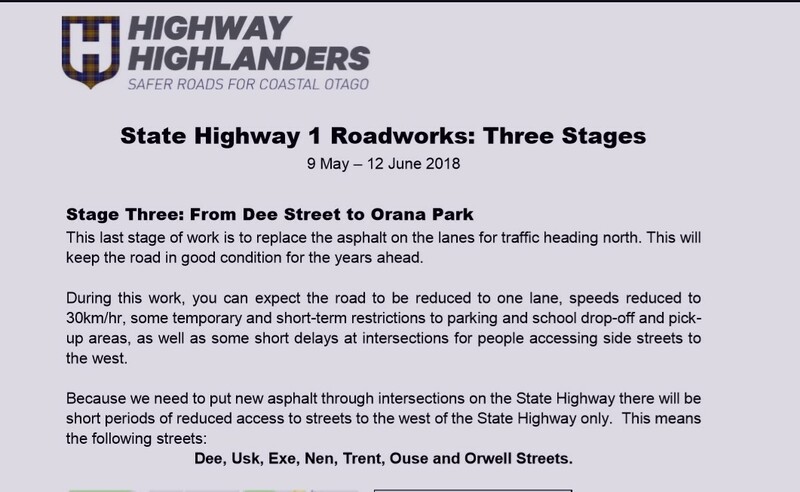 There will be 3 stages of road closures and the one that affects our school begins on Saturday 19th May on the north bound lanes from Dee Street to Orana Park. We have attached a copy of the 3 different road closures to our email so please have a look at them and see how it affects you. A copy of our road closure is shown below. 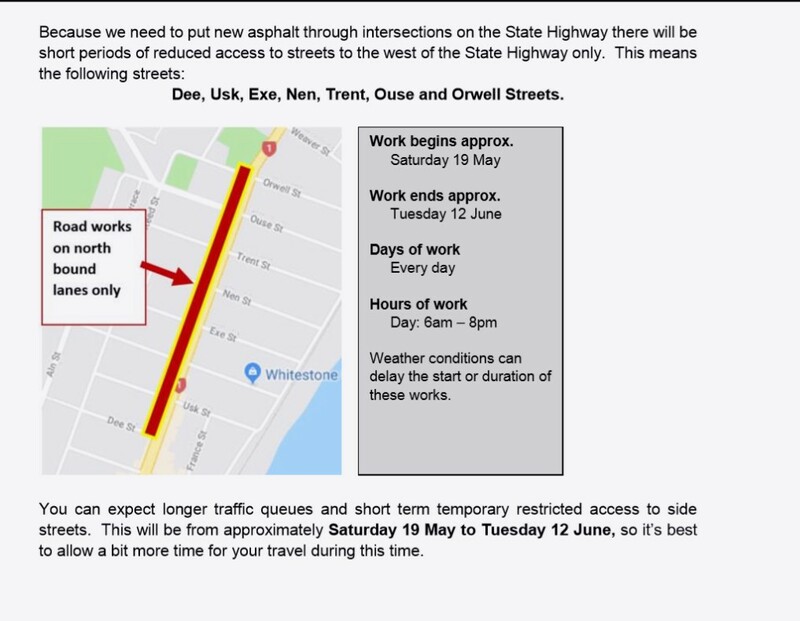 Please do not park in the western side of Reed St from 21st May to 12 June due to road works. Buses need this area for collecting children. Please send us your sport photos as we would love to display them. You can email them to office@stjoseph.school.nz or you can drop off a memory card or USB stick. A reminder about the Open Day and Evening for all Yr 6,7 & 8 parents is on Thursday 17th May at St Kevin's College. Principal's Welcome is at 1.00 and 7.00 pm. On Friday 8th June, Subway will be donating half the cost of all lunches back to school on this day. Lunches will still cost $6.00 each. At this stage we have not received any dates for the term 3 swimming programme but we will let you know when we receive them. A note will be coming home with Yr 7 students today regarding the upcoming Vision Screening. If you do not wish your child to be included in this screening, please return the slip by 18th May. Have unfortunately had to cancel this terms archery after school programme and they will be in touch regarding term 3 programme which will include Yr 5 & 6. FUNFIT KIDS - fun and fitness for PRIMARY SCHOOL kids at the Waitaki Community Recreation Centre. Held on Fridays from 4.00 to 4.45 pm starting Friday 18th May. Costs $36 for 6 sessions. Register online now at www.sport.co.nz/waitakicrc ph 434 6932 for more info.Skills are chosen with the developmental needs of growing kids in mind. The work outs develop balance, accuracy, fitness and strength, encourage teamwork and are lots of fun.